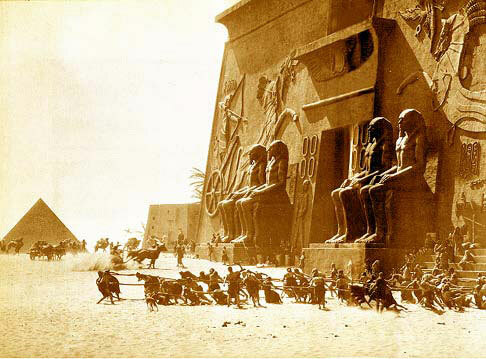 When filming of THE TEN COMMANDMENTS was completed Cecil B. DeMille ordered the massive sets to be buried at some undisclosed location. The location of this odd burial has been a mystery for decades but now it's pretty much accepted that it's somewhere in the Guadalupe-Nipomo dunes. Props found at the site are on display at two locations in the city of Guadalupe. You can check out the video on Youtube. DeMille was one odd fellow. Why bury it? "DeMille was one odd fellow." And so were his films... For instance, near the end of the 1956 "epic" TEN COMMANDMENTS, Moses - by throwing the stone tablets bearing the commandment of God not to kill (!) - actually *kills* people. It is a pity that this movie is peppered with such idiotic scenes - otherwise I really like the characters of the old Pharaoh and Nefertiti. Without those awkward scenes - featuring a bewildered fool Moses (and his narcissistic, tyrannical and vengeful God) -, the movie could be quite enjoyable (or at least bearable) for me.